Showdown proved (mostly) sunny again for us (one thing we love about Showdown? When it rains, no one leaves! ), as we brought our 11th match to the Lower East Side on June 20, 2018, teaming up for the first time with B/R Football in one to remember. Kicking off in front of thousands of roaring fans packed on the pitch and along the entire Park perimeter, the B/R Football x Steve Nash Foundation Showdown presented by MINI fielded some of the match’s most talented rosters in Showdown’s history, all in support of our work for underserved kids. The match opened with Panini’s presentation of the Spirit of Showdown award to a surprised and honored Steve Nash, who’s image was featured on a giant, custom playing card recording his career assists . . . to kids. Highlights include TJ McConnell, who hadn’t played since the 8th grade, with the first assist of the game in the initial five minutes; Asmir Begović blocking everything in sight during the second half; and the phenomenal play of Giuseppe Rossi, a perennial fan-favorite making his return after last year’s rare absence. B/R host Adam Lefkoe called the match with live, on-field commentating assisted by former Major League Soccer standout Calen Carr. TEAM BLACK: Steve Nash, Giuseppe Rossi, Charlie Davies, Kyle Martino, Dave Finocchio, Francesco Valiani, John O’Brien, Simone Sandri, Massimo Gobbi, John Nash, Asmir Begović, D’Angelo Russell, and CJ McCollum (with great sideline support from Joel Embiid). TEAM WHITE: Timothy Weah, Dwayne De Rosario, Weston McKennie, Salomon Kalou, Christian Fuchs, Graeme Le Saux, Jeff Matteo, Florencia Galarza, TJ McConnell, Derek Kierans, Mike Quarino, Spencer Dinwiddie and Davide Zappacosta. Prior to the match, the New York Red Bulls delivered a youth soccer clinic attended by athletes and youth from Street Soccer USA. Street Soccer USA is national non-profit headquartered in New York and San Francisco harnessing the power of the world’s game to create a more level playing field for all. The kids were welcomed to Showdown with a front row view of the action. At the same time as the Clinic, Showdown’s Fan Fest opened to guests with exciting innovative and interactive fan opportunities presented by sponsors throughout the evening – Panini with sticker books and trading cards that delighted young and old, Upper 90 with customization for Showdown apparel, and NYCFC and NYRB engaging fans with on-site activations to challenge us all. A first-ever halftime surprise performance featured the Harlem Gospel Choir and Vanessa Carlton, presented by MINI, and non-profit Sing For Hope, with Vanessa playing her hit A Thousand Miles out of the back of a MINI, and the Harlem Gospel Choir rocking Forsyth Street with Pharrell’s “Happy” and more – amazing. Goals were scored by Davies, Rossi, Nash, McKennie, De Rosario, Weah and Kalou, who scored the last thriller in the final 30 seconds of the game. The final outcome showed 5 to 4, with Team White taking home the victory. After the match, last year’s Spirit of Showdown Award winner, Embiid, took center pitch to award the winning team a beautiful Showdown trophy, and Showdown’s Most Valuable Player Award was presented by MINI’s Lee Nadler to McKennie, Showdown’s youngest ever recipient. Players suited up in Nike gear and shoes, and jerseys designed by B/R Football with printing by Uni-Sport and Sports Time. The official Showdown t-shirt is for sale at stevenash.org/assist. 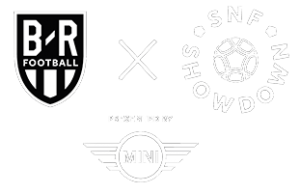 This year’s B/R Football x Steve Nash Foundation presented by MINI was sponsored by Gatorade, International Champions Cup, Panini, Guinness, Lyft, MLS WORKS, New York City FC, and New York Red Bulls, with support from Uni-Sport, Upper 90 Soccer, Phebe’s Tavern, and Halo Top Creamery. Following the game, players joined with one another for a team dinner hosted by the Penny Farthing, followed by an intimate After Hours party at Cipriani Club 55, hosted by Guinness and Guinness USA. Follow on Twitter & Instagram @SteveNashFdn with #ShowdownNY, or visit SteveNash.org/Showdown for photos, recaps, more information, and merchandise on sale now! Hope to see you next year!